Rupert Murdoch believes the Brexit decision is "wonderful." In his first public remarks about the referendum result, delivered in London on Tuesday, Murdoch compared it to a prison break that frees the British people. Murdoch owns several highly influential media properties in the United Kingdom, including The Sun, The Times and Sky News. While he is famous for expressing his political views through his newspapers, the papers went in different directions ahead of the vote. His tabloid The Sun called for voters to leave the EU, while The Times called for Britain to remain. On Tuesday, Murdoch spoke at a Times CEO summit. No transcript of his remarks was immediately available, according to a spokesman. But Ed Conway, who works for both The Times and Sky News, tweeted some of Murdoch's opinions. 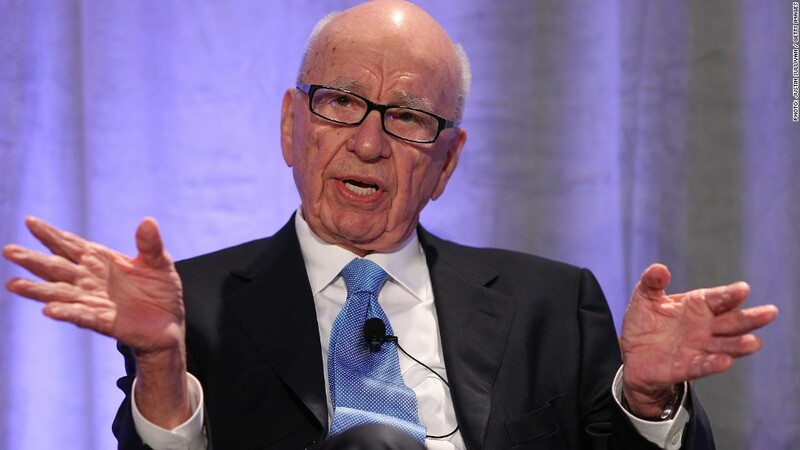 "Rupert Murdoch: it's time for change. I just hope the right people give the right leadership," Conway wrote. He also said Murdoch called the decision "wonderful." "Rupert Murdoch: if [Boris] backtracks on serious things there'll be another bloody revolt," Conway tweeted, relaying Murdoch's comments. Another attendee, Jenny Halpern Prince, said Murdoch expressed support for Michael Gove, a member of Parliament and one of the leaders of the "Leave" campaign. If Gove becomes prime minister, he "will do a fine job of running the country," Murdoch said. Stock in Murdoch's newspaper company, News Corp (NWS), has fallen about 10% amid a broader market selloff in the wake of the vote. But according to Conway's account of the event, Murdoch is at least partly blaming the Remain campaign's rhetoric for that. He tweeted, "Murdoch: [Falling pound] makes us more competitive. [Market falls] are fault of remain campaign: Cameron/Osborne's scorched earth policy."